Located on Carpenter and Wisner Avenues for 2 weeks at the end of July. This booth has been raising funds for the community since 1961! For $2.00 you have 25 chances to win. Everyone wins a prize! This game is great for young children too! All proceeds benefit the Middletown Lions Club's charities. Through the generoisty of the Middletown VFW, our club has been able to raise thousands of dollars each year to support our community activities. Fairgoers park in the lot (VFW's land) for just a $5 donation. Entrance is on Wisner Ave at the intersection of Carpenter Ave close to the fair gate. 25% of our net income from this project goes to the Middletown VFW. 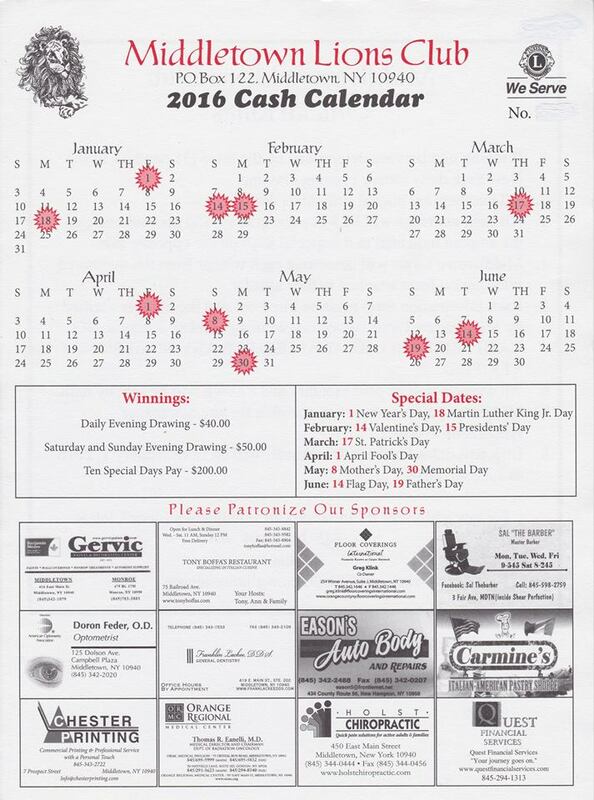 Beginning in September, the Middletown Lions Club is selling a 6 month cashcalendar which begins January 1st through June 30th. The cost of the calendar is only $20.00 and you have the chance to win a minimum of $40 everyday, $50 on the weekends and $200 on the designated special days! This project has become our club's single most successful fund raiser. Without it we could not fund our "Weekend Back Pack Program," which provides children with nutritional foods they can prepare themselves; provide free eye exams, eye glasses, hearing exams and hearing assistive devices for those who qualify, sponsor a Middletown Little League team and fund our Middletown High School and SUNY Orange scholarships just to mention a few of our community service projects. Please get your calendar today - they make great holiday gifts and stocking stuffers. Call us at 845-344-8104 to get your lucky numbers today! See the complete list of the community service projects we support from our fund raising activities on our website. Each year our Middletown Lions Club sponsors a fund raising Pancake Breakfast and Raffle to help raise money for our community service projects. The members of Middletown Hoffman Lodge #412 and The Middletown Lions Club are proud to be working together, on a joint endeavor, to benefit a chosen community need. Together, the Lions and Masons for the past two years have prepared a delicious homemade spaghetti dinner from a Mason's family recipe. Everything is homemade from the spaghetti sauces (meat, marinara and clam), tossed green salad, scrumptous garlic bread with melted mozzarella cheese to the the apple crisp for dessert. There is a raffle too to help raise funding for their chosen charity. The first year all proceeds were donated to Hurricane Sandy victems and last year the proceeds were divided between the Greater Middletown Inerfaith Council Food Pantry and our "No Kid Hungry" weekend back pack program. The Fabulous Gourmet Spaghetti Dinner and Raffle is always held the 2nd Saturday in March so please mark your calendars and support this great group effort. Our annual chocolate bunny sale is one of our club's best fund raisers. The high quality milk, dark and white chocolate is a crowd favorite for only $5.00. Look for them about 1 month before Easter, about March 1, 2015! Support the Middletown Lions Club Foundation by shopping online at smile.amazon.com and Amazon will donate 0.5% of the price of your eligible AmazonSmile purchases to our foundation.